Ce document au format PDF 1.5 a été généré par PScript5.dll Version 5.2.2 / Acrobat Distiller 10.0.0 (Windows), et a été envoyé sur fichier-pdf.fr le 03/02/2015 à 22:32, depuis l'adresse IP 37.211.x.x. La présente page de téléchargement du fichier a été vue 433 fois. Taille du document: 3.7 Mo (89 pages). 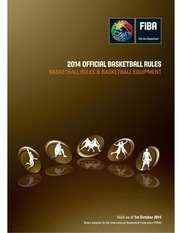 Throughout the Official Basketball Rules, all references made to a player, coach, official, etc. in the opponents' basket and to prevent the other team from scoring. is defended by a team is their own basket. basket, the sidelines and the centre line. All lines shall be drawn in white colour, 5 cm in width and clearly visible. and the sidelines. These lines are not part of the playing court. the centre circle is painted, it must be the same colour as the restricted areas. the mid-point of the free-throw lines (Diagram 2). shall lie on the imaginary line joining the mid-point of the 2 endlines. areas must be painted in one colour. free throws, shall be marked as in Diagram 2.
outer edge 0.90 m from the inner edge of the sidelines. 1.575 m. The arc is joined to the parallel lines. The 3-point line is not part of the 3-point field goal area. inner edge of the nearest endline. ending 1.20 m from the inner edge of the endline. of the parallel lines directly below the front edges of the backboards. The no-charge semi-circle lines are part of the no-charge semi-circle areas. and/or behind the scorer’s table. organising body of the competition.  A player when he is on the playing court and is entitled to play.  A substitute when he is not on the playing court but he is entitled to play.  No more than 12 team members entitled to play, including a captain.  A coach and, if a team wishes, an assistant coach.  The official beckons the substitute to enter the playing court.  Shirts of the same dominant colour front and back. same colour as the shirts. The shorts must end above the knee.  Socks of the same dominant colour for all players of the team. numbers, of a solid colour contrasting with the colour of the shirt.  Those on the back shall be at least 20 cm high. Those on the front shall be at least 10 cm high. The numbers shall be at least 2 cm wide. Teams shall use numbers 0 and 00 and from 1 to 99. Players on the same team shall not wear the same number. Any advertising or logo shall be at least 5 cm away from the numbers.  The second team named in the programme (visiting team) shall wear darkcoloured shirts.  However, if the 2 teams agree, they may interchange the colours of the shirts. unfair advantage is not permitted. even if covered with soft padding. ▬ Headgear, hair accessories and jewellery. ▬ Compression sleeves of the same dominant colour as the shirts. ▬ Knee braces if they are properly covered. ▬ Protector for an injured nose, even if made of a hard material. ▬ Non-coloured transparent mouth guard. ▬ Spectacles, if they do not pose a danger to other players. cloth, pliable plastic or rubber. ▬ Non-coloured transparent taping of arms, shoulders, legs, etc. In the event of injury to a player(s), the officials may stop the game. an injured player, the officials may stop the game immediately. reduced to fewer than 5 players on the playing court. official, to attend to an injured player before he is substituted. 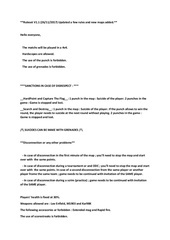 doctor's judgement, the injured player requires immediate medical treatment. and the affected area or open wound has been completely and securely covered. during a time-out taken by either team, before the scorer’s signal for the substitution, that player may continue to play. marked 'Captain's signature in case of protest'. they arrive after the beginning of the game. be the first to provide this information. and remain within their team bench area. assistant coach shall not address the officials. duties and powers of the coach if, for any reason, the coach is unable to continue. number of the player who will act as captain on the playing court. as coach because of injury, his substitute as captain may replace him as coach. free-throw shooter is not determined by the rules. The game shall consist of 4 periods of 10 minutes each. There shall be a half-time interval of play of 15 minutes.  20 minutes before the game is scheduled to begin.  When the game clock signal sounds for the end of the period. referee on the toss for the jump ball. continue with as many extra periods of 5 minutes as is necessary to break the tie. playing court in which their opponents' basket is situated. Teams shall exchange baskets for the second half. perimeter, the lighting takes precedence over the game clock signal sound. The ball can be either live or dead.  During the jump ball, the ball leaves the hand(s) of the referee on the toss.  During a free throw, the ball is at the disposal of the free-throw shooter.  During a throw-in, the ball is at the disposal of the player taking the throw-in.  Any field goal or free throw is made.  An official blows his whistle while the ball is live. ▬ A further penalty (free throw(s) and/or possession).  The game clock signal sounds for the end of the period.  The shot clock signal sounds while a team is in control of the ball. ▬ An official blows his whistle. ▬ The game clock signal sounds for the end of the period. ▬ The shot clock signal sounds. infraction other than by the free-throw shooter. continuous motion which started before the foul occurred. clock signal sounds for an end of period or the shot clock signal sounds. The location of a player is determined by where he is touching the floor. The location of an official is determined in the same manner as that of a player. 2 opponents at the beginning of the first period. his own basket with one foot close to the centre line. wishes to occupy one of those positions. higher than either of them can reach by jumping. Neither jumper shall leave his position until the ball has been legally tapped. of the non-jumpers or the floor. the ball has been tapped. An infraction of Art. 12.2.1, 12.2.4, 12.2.5, 12.2.6, and 12.2.8 is a violation.  A held ball is called. which of the opponents last touched the ball. line extended, opposite the scorer’s table). of the ball nor was entitled to the ball before the first foul or violation. All periods other than the first period are to begin. Alternating possession is a method of causing the ball to become live with a throwin rather than a jump ball.  Begins when the ball is at the disposal of the player taking the throw-in. ▬ The ball touches or is legally touched by a player on the playing court. ▬ The team taking the throw-in commits a violation. ▬ A live ball lodges between the ring and the backboard during a throw-in. the place nearest to where the jump ball situation occurs. jump ball will be entitled to the first alternating possession. the violating team for a throw-in at the place of the original throw-in. does not cause the team entitled to the throw-in to lose that alternating possession. leg or strike it with the fist. the leg is not a violation. An infraction of Art. 13.2 is a violation. or dribbling it or has a live ball at his disposal.  A player of that team is in control of a live ball.  The ball is being passed between team-mates.  An opponent gains control.  The ball becomes dead. and is then thrown into the air towards the opponents' basket. A tap is when the ball is directed with the hand(s) towards the opponents' basket. A tap and a dunk are also considered as shots for a field goal. shooter, both feet have returned to the floor. to score. In this case it is not essential that the ball leaves the player's hand(s). motion, usually upward, has started. within and below the level of the ring.  A goal released from a free throw counts 1 point.  A goal released from the 2-point field goal area counts 2 points.  A goal released from the 3-point field goal area counts 3 points. team on the playing court. the goal does not count. A throw-in occurs when the ball is passed into the playing court by the out-ofbounds player taking the throw-in.  The official is no more than 4 m from the player taking the throw-in. game was stopped by the official, except directly behind the backboard.  At the beginning of all periods other than the first period.  Following a free throw(s) resulting from a technical, unsportsmanlike or disqualifying foul. team-mate at any place on the playing court. throw-in line opposite the scorer’s table in the team’s frontcourt. the place nearest to the infraction. the subsequent throw-in shall be administered at the free-throw line extended. count starts when the ball is at the disposal of the first player out-of-bounds.  Take more than 5 seconds to release the ball.  Step into the playing court while having the ball in his hand(s).  Cause the ball to touch out-of-bounds, after it has been released on the throwin.  Touch the ball on the playing court before it has touched another player.  Cause the ball to enter the basket directly. line as far as circumstances allow. thrown-in across the boundary line. An infraction of Art. 17.3 is a violation. A time-out is an interruption of the game requested by the coach or assistant coach. Each time-out shall last 1 minute. A time-out may be granted during a time-out opportunity. official has ended his communication with the scorer's table.  For the non-scoring team, a field goal is scored. A time-out opportunity ends when the ball is at the disposal of a player for a throwin or for a first or only free throw.  1 time-out during each extra period. Unused time-outs may not be carried over to the next half or extra period. an infraction having been called. successful field goal unless an official has interrupted the game. clearly for a time-out, making the proper conventional sign with his hands.  Begins when the official blows his whistle and gives the time-out signal. the officials that a request for a time-out has been made. shall immediately stop the game clock and sound his signal. provided they remain within the vicinity of their team bench area.  The last or only free throw is successful. resulting from more than 1 foul penalty, each set is to be treated separately. A team may substitute a player(s) during a substitution opportunity. 2:00 minutes or less in the fourth period and in each extra period. throw-in or a first or only free throw.  The team is reduced to fewer than 5 players on the playing court. is on the team bench after having been legally substituted. making the proper conventional sign with his hands, or sit on the substitution chair. He must be ready to play immediately. sounded for such a request. notify the officials that a request for a substitution has been made. whistle, gives the substitution signal and beckons him to enter the playing court. reporting either to the scorer or the official. the coach, recorded as 'B'.  Has committed his 5 fouls. again until he has played in the next clock-running phase of the game. penalty, each set is to be treated separately. after the scheduled time to begin.  Its actions prevent the game from being played.  It refuses to play after being instructed to do so by the referee. the forfeiting team shall receive 0 points in the classification. series or Play-Offs by 'forfeit'. This does not apply for Play-Offs (best of 5). players on the playing court ready to play. receive 1 point in the classification. defaults in the first or in the second game shall lose the series by 'default'. A violation is an infraction of the rules. any object other than a player above, on or outside the boundary line.  A player or any other person who is out-of-bounds.  The floor or any object above, on or outside the boundary line. touching something other than a player. on or outside the boundary line, this player causes the ball to go out-of-bounds. throws, taps, rolls the ball on the floor or deliberately throws it against the backboard. backboard and touches it again before it touches another player. permits the ball to come to rest in one or both hands. floor or another player before the player who threw it touches it again with his hand. court is considered to be fumbling the ball.  Successive shots for a field goal.  Fumbling the ball at the beginning or at the end of a dribble.  Tapping the ball from the control of another player.  Deflecting a pass and gaining control of the ball.  A shot for a field goal.  A touch of the ball by an opponent.  A pass or fumble that has touched or been touched by another player. in this article, in any direction, while holding a live ball on the playing court. while the other foot, called the pivot foot, is kept at its point of contact with the floor. ▬ The moment one foot is lifted, the other foot becomes the pivot foot. ▬ If one foot is touching the floor, that foot becomes the pivot foot. ▬ If both feet are off the floor and the player lands on both feet simultaneously, the moment one foot is lifted, the other foot becomes the pivot foot. landing on both feet simultaneously, then neither foot is a pivot foot. floor before the ball is released from the hand(s). not be returned to the floor before the ball is released from the hand(s). while lying or sitting on the floor, gains control of the ball. the game clock is running.  Makes an attempt to leave the restricted area. the ball is leaving or has just left the player's hand(s) on the shot for a field goal. for less than 3 consecutive seconds. the floor outside the restricted area. opponent is in an active legal guarding position at a distance of no more than 1 m.
A closely guarded player must pass, shoot or dribble the ball within 5 seconds. that team must cause the ball to go into its frontcourt within 8 seconds. frontcourt of the team in control of the ball. the dribbler are completely in contact with the frontcourt.  A ball having gone out-of-bounds.  A player of the same team having been injured.  A jump ball situation.  A cancellation of equal penalties against both teams. that team must attempt a shot for a field goal within 24 seconds. disregarded and the goal shall count. occurred, the signal shall be disregarded and the game shall continue. disregarded and the game shall continue. All restrictions related to goaltending and interference shall apply.  For any valid reason not connected with either team. from the time it was stopped. game was stopped, the shot clock shall be reset to 14 seconds. committed by the team in control of the ball.  24 seconds, if the opposing team gains control of the ball. was in control of the ball before the ball touched the ring. corrected and possession of the ball shall be awarded to that team.  the ball is passed between the players of that team in their frontcourt.  after the ball has touched the backcourt of that team. This restriction applies to all situations in a team's frontcourt, including throw-ins. be illegally returned to their backcourt. place nearest to the infraction except directly behind the backboard.  Begins when the ball leaves the hand(s) of a player in the act of shooting. ▬ No longer has the possibility of entering the basket.  After it has touched the backboard. while it is in flight to the basket and before it touches the ring.  The ball no longer has the possibility of entering the basket.  The ball has touched the ring. basket or the backboard while the ball is in contact with the ring.  A player reaches through the basket from below and touches the ball. basket, thus preventing the ball from passing through the basket. basket or has been caused to enter the basket.  A player grasps the basket to play the ball. possibility of entering the basket. extended, unless otherwise stated in the rules.  1 point, if the ball was released for a free throw.  2 points, if the ball was released from the 2-point field goal area.  3 points, if the ball was released from the 3-point field goal area. The awarding of the points is considered as if the ball had entered the basket. penalty charged against the defensive player.  The sides by the outer edge of the arms and legs. are raised. The distance between his feet will vary according to his height. playing court not already occupied by an opponent. above him when he jumps vertically within that space. the player who left his vertical position (cylinder) is responsible for the contact. cylinder) or having his hands and arms extended above him within his own cylinder.  Using his arms to create more space for himself (pushing off).  He has both feet on the floor. he must maintain them in a vertical position inside the imaginary cylinder. time and distance do not apply. in front of him, even if this is done within a fraction of a second. without causing contact before taking his position. to prevent the dribbler from passing by him. the player with the ball and having both feet on the floor. backwards in order to maintain the initial legal guarding position. backwards, but not towards the player with the ball. caused by the player with the ball. and take any position not already occupied by another player. or distance either to stop or change his direction. to land again at the same place. already occupied by an opponent(s) at the time of take-off. jumper is responsible for the contact. Moving under a player who is in the air and causing contact is usually an unsportsmanlike foul and in certain circumstances may be a disqualifying foul. reaching a desired position on the playing court.  Was stationary (inside his cylinder) when contact occurs.  Had both feet on the floor when contact occurs.  Was moving when contact occurred. stationary opponent when contact occurred. provided there is no contact. to avoid the screen by stopping or changing direction. The distance required is never less than 1 and never more than 2 normal steps. with or without the ball. when he is moving and his opponent is stationary or retreating from him. charging or holding of the player who is being screened. contact occurs, it is blocking or holding. The touching of an opponent with a hand(s) is, in itself, not necessarily a foul. movement of an opponent, such contact is a foul. with an opponent with or without the ball, to impede his progress. ball, or to create more space for himself. gaining control of the ball.  Get free to receive the ball.  Prevent the defensive player from playing or attempting to play the ball.  Create more space for himself. The principle of verticality (cylinder principle) applies also to post play. respect each other's rights to a vertical position (cylinder). movement using extended arms, shoulders, hips, legs or other parts of the body. does not justify his contact with an opponent from the rear. of movement. This contact (holding) can occur with any part of the body. moves or attempts to move an opponent with or without the ball. in any rough or violent play. A personal foul shall be charged against the offender. place nearest to the infraction.  If the offending team is in the team foul penalty situation, then Art. 41 will apply. and, in addition, 1 free throw. not count and 2 or 3 free throws will be awarded. each other at approximately the same time.  A valid field goal, or a last or only free throw is scored, the ball shall be awarded to the non-scoring team for a throw-in at any place at the endline. awarded to this team for a throw-in at the place nearest to the infraction. players and team bench personnel with the officials, table officials and commissioner, if present. intent of this rule shall be considered as a technical foul. 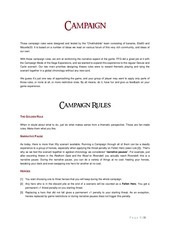 the game, unless there is repetition of the same infraction after the warning. between the infraction and the game being stopped shall remain valid. and fair play. These should be stopped immediately by the officials and, if necessary, by public order enforcement officers. the organising body of the competition. officers must intervene immediately to protect the teams and officials. of game equipment must not be permitted by the officials. offending team shall be given a warning.  Disregarding warnings given by officials.  Using language or gestures likely to offend or incite the spectators.  Excessive swinging of elbows. basket or by preventing a throw-in from being taken promptly.  Falling down to fake a foul. charged against the defensive player. 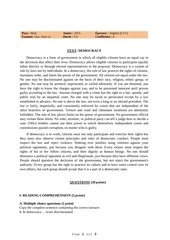 opponents, or an infraction of a procedural or an administrative nature. as a result of the unsportsmanlike behaviour of other team bench personnel. shall count as one of the team fouls. and shall not count as one of the team fouls.  A throw-in at the centre line extended, opposite the scorer’s table.  A jump ball in the centre circle to start the first period.  Excessive, hard contact caused by a player in an effort to play the ball. offensive player and the opponent’s basket. the player taking the throw-in. game and to judge only the action. An unsportsmanlike foul shall be charged against the offender.  A jump ball in the centre circle to begin the first period.  If the foul is committed on a player not in the act of shooting: 2 free throws. count and, in addition, 1 free throw. made, 2 or 3 free throws. scoresheet, he shall be replaced by the captain (CAP). A disqualifying foul shall be charged against the offender. game or, if he so chooses, he shall leave the building.  To any opponent, as designated by his coach in the case of a non-contact foul.  To the player who was fouled in the case of a contact foul.  If the foul is a non-contact foul: 2 free throws. count and in addition 1 free throw. made: 2 or 3 free throws. team bench area during a fight or during any situation which may lead to a fight. during a fight, or during any situation which may lead to a fight, shall be disqualified. to maintain or to restore order. In this situation, they shall not be disqualified. team bench area, a single technical foul ('B') shall be charged against the coach. for a throw-in at any place at the endline. any situation which leads to a fight, shall be dealt with in accordance with Art. 42.
the game immediately. He must be substituted within 30 seconds. team fouls in a period. committed in the following period or extra period. may arise when additional foul(s) are committed. All fouls shall be charged and all penalties identified. The order in which all infractions occurred shall be determined. recorded and cancelled they are considered as never having occurred. rights to possession of the ball. penalty, that penalty can no longer be used for cancelling any remaining penalties. All remaining penalties shall be administered in the order in which they were called. penalties remaining for administration, the game shall be resumed as follows. awarded to this team for a throw-in at the place nearest to the first infraction. position behind the free-throw line and inside the semi-circle. possession of the ball resulting from a single foul penalty. by his coach shall attempt the free throw.  Take a position behind the free-throw line and inside the semi-circle. basket from above or the ball touches the ring.  Release the ball within 5 seconds after it is placed at his disposal by the official. entered the basket or has touched the ring.  Not fake a free throw. positions in these spaces, which are considered to be 1 m in depth (Diagram 6).  Occupy free-throw rebound places to which they are not entitled. place until the ball has left the hand(s) of the free-throw shooter.  Distract the free-throw shooter by their actions. extended and behind the 3-point field goal line until the free throw ends. An infraction of Art. 43.2.3, 43.2.4, 43.2.5 and 43.2.6 is a violation. shooter, the point, if made, shall not count.  The point, if made, shall count.  The violation(s) shall be disregarded. a throw-in at any place at the endline. extended unless that team is entitled to further possession. Ce fichier a été mis en ligne par un utilisateur du site. Identifiant unique du document: 00300663.